Mac's Birth Story, in which the Protagonist Learns an Important Lesson About Herself — deep hunger, deep gladness. This is the story of how I became Mac's mom. It's long and personal. Further posts will detail what a beautiful genius he is, but this one is about his parents. On December 14th at 4:30, Jordan and I took our pre-packed (way overpacked, by the way - hilariously overpacked) hospital bags to Mission Hospital, which is exactly 3 minutes from our house. In fact, we could nearly see our house from the window of our hospital room. Because we were there for a scheduled induction, it was bizarre to in like we were checking into a hotel, knowing we'd walk out with a baby. We were both so nervous and excited, but trying to downplay both of those emotions in order to appear cool and in-control. Jordan checking out the view. See how cool he's playing it? The room we were put in was a beautiful mountain view room, which I was relieved about because I know it was a roll of the dice that we’d get an ugly room facing construction. We met our nurse, S (no names in this story because that just seems like the right thing to do) who was wonderful, warm, and friendly - so wonderful, given that I had literally never checked into a hospital and had all kinds of of butterflies in my stomach. She told me to put on a gown and hang out for my cervical exam to see how far along I was. They hooked the baby up to a heart monitor at that point and we saw that I was contracting every 10 minutes or so: irregularly, but definitely happening. It was comforting to me to know that those "muscle contractions" I'd been feeling were actually uterine contractions, and that I wasn't crazy. She "checked me" (cool OB term for "seeing how dilated you are"), and found that I was about 2 1/2 cm dilated, which was what I'd been two days before at my 39 week doctor's visit. My OB, who I am absolutely in love with, wasn’t on call until the next day, so I saw the on-call doc. She placed a balloon catheter to kick-start the process of labor. I'll let you Google what that is, because it's unsavory. You're welcome. Once the catheter was placed, it was pretty uncomfortable - especially trying to navigate getting up to use the bathroom with that, an IV, and monitors checking the baby's heart rate - I felt like the bionic woman. It was kind of hilarious. With the help of the catheter, my contractions started ramping up in intensity and frequency. We visited with both sets of parents who had come to the hospital and were in the waiting room, despite the fact that nothing was going to happen that night. Even still, it was wonderful to know they were out there. My mom, of course, brought a giant bag of candy. I was eating everything I could because I knew they were going to cut me off at a certain point and I eat every three hours like a small child. While we were chatting, I was contracting pretty intensely - several times, I had to stop talking to let a contraction run its course. They were the real deal. Here's where I say: women who've done this whole thing without drugs? You are AMAZING. So that meant I was dilated to 4.5! Hooray! It was about midnight at that point, and we were really excited because we’d been told that it could take up to 12 hours for me to dilate to that point. Around the same time, they started Pitocin in my IV. I was a little bit of a zombie because (since we thought it was going to take longer for me to dilate enough to start Pitocin), they'd given me a sleep aid to try and get some rest. I dilated more quickly than anybody had anticipated, so I was super drowsy, but also contracting like a beast. The fetal heart monitor was probably the most annoying part of this process. Every time I turned to get comfortable, it would shift the monitor on my belly and this crazy alarm would go off signaling the loss of the baby's heart rate. (In reality, the baby was fine, but it spooked us every time!). I had to just resign myself to be careful about the positions I slept in to avoid setting off the alarm. Jordan slept in a recliner by my bed, and we got a little, but not much, sleep. We were too excited and neither of us was really comfy. At 6 AM or so, our nurse did a cervical exam and told me that I was about 6 cm dilated. Not as much progress as we’d hoped, but not nothing. She encouraged me to get up and walk around, so Jordan and I did a couple of laps around the hallway to try to keep things moving along. I was a little woozy after a couple of laps, so we came back in and got settled back in the bed. Around 8 AM, our parents were on their way back to the hospital (Mom hadn’t slept all night - Jordan was keeping everyone apprised via text). We had another nurse shift change and met K, who was defnitely the toughest cookie of the nurses we'd had all so far. If I'm honest, I wasn't sure we'd totally get along, but I ended up absolutely loving this women, as she was my advocate in so many ways. I was dilated enough to receive the epidural at any point that I wanted, so they told me to give them about a 30-minute heads up when I thought I was about ready to have the epidural catheter placed. I labored for about 2 hours, still contracting irregularly, then went ahead and called for it. Our CRNA came in to administer the epidural. I was a little nervous about this process, mostly because I’d read that one of the possible side effects is a spinal headache which can last days after labor. Being someone who’s prone to headaches in general, I was really nervous that that would happen to me. The CRNA had Jordan sit down in front of me and told me to round my back like a cat. She administered some local anesthetic first to help the pain of the epidural catheter placement, but when she started to place the catheter, I could still feel lots of it. It wasn’t just “pressure” (medical term used to cover all manner of sins), but actual pain and discomfort. She tried a couple of times to reposition it, but it still felt uncomfortable. Despite that, she felt confident about the placement and we decided to go ahead and have her administer the epidural anesthesia at that point. Once the epidural started taking effect, they laid me back in bed and I started to feel more numb on my right side than my left. They propped my right side up on some pillows to try to even out the pain medication to both sides, and eventually it did - more or less. Jordan's parents came in to visit, and I had some Popsicles which I promptly threw up (my poor in-laws! That moment went like this: "Yeah, l'm feeling really good! I'm...actually, you know what? I'm about to throw up. I'm so sorry!! I'm so sorry!" Cue: them fleeing the room.). My parents came in to visit and I started feeling the sensation of contractions without the pain, which was awesome. I still had a little unevenness of numbness, but I could move my legs a little and that was kind of comforting and helpful to K (instead of being totally dead-legged from the waist down, I was able to help her a little in moving my legs). I took this uneventful opportunity to take a quick nap. My precious parents visiting sometime around 10 AM. It was at this point in the day that things started to ramp up and get a little dramatic. My fabulous OB (henceforth referred to as OB) came on call that afternoon! I was so relieved to see her - I liken it to having a sleepover at a friend's house, and you get sick, and your friend's parents have to take care of you, and then you finally get to go home and see your mom and you're SO HAPPY. Yeah. It's like that. Anyway, she did a cervical exam and said that I was 10 cm! Finally! Jordan had gone to eat lunch with his parents in the cafeteria. I texted him that OB said we'd be pushing within the hour, and he RAN back upstairs as we started preparing to do the damn thing. OB had told us that the baby was "OP," which is medical speak for "sunny-side up." This is different from breech - his head was down, but he was positioned to come out facing the ceiling rather than the floor. K put a “peanut ball” between my legs (basically a giant yoga ball, except shaped like a peanut) and laid me on my side to try to get the baby turned over naturally. She flipped me from side to side working on that, and I could still help her at that point because I still had some use of my legs. Peanut pillow sticking horizontally out! Our CRNA came back in and gave me a bolus (basically just a "boost" in my epidural catheter) of fentanyl and lidocaine, in addition to bumping my epidural anesthesia again. At this point, my legs were completely numb and lifeless, so K was holding my top leg up for the rest of our efforts to push (God bless her). Every push became more and more painful, and no position I was in could help. I was also vomiting every 10 minutes or so, so things were pretty unpleasant. The baby’s head was all the way down and OB could see its hair, so in addition to the searing pain in my side, there was tons of pressure to push and finish the job. Eventually the pain was numbed by the medication and I was able to push really hard, but still not hard enough to get the baby out. OB said that the baby’s heart rate was dropping significantly during contractions, so we should give it a rest and see where we were. The baby was fine when I wasn’t pushing, so she suggested that we give both me and the baby a break for about an hour. They stopped Pitocin and I took a nap (super weird considering the circumstances) because I was completely exhausted. We waited about an hour and I was able to conk out pretty intensely. Around 45 minutes later, the pain in my left side came back completely and I started throwing up again. K paged the CRNA, who came back in and did another bolus of fentanyl, lidocaine, and the epidural anesthesia. They’d warned me that the first round of fentanyl is amazing, but every subsequent dose is less and less effective, and that’s exactly what I experienced. I was only about 50% numb at that point. When OB came back in, she said that we had about 15 minutes to get the baby out vaginally in order to keep the baby safe and asked me if I thought I could do it. I told her I wanted to try, but that unless my left side went numb again, there would be no way I could focus on pushing because the pain was so great. I never got more numb and tried to push twice as hard as I could, but at this point was borderline screaming with every push and totally unable to focus on moving the baby down. OB gently told me that we needed to do a C-section in order to keep the baby safe. I knew how disappointed she was to make that call because she was so intent on getting the baby delivered vaginally, and I also knew that if she was saying we needed surgery, it must be the last-ditch option. A big part of me was extremely relieved to be going into surgery because I was completely exhausted. Once she called for a C-section (and she stipulated a STAT C-section, so it was extra urgent-feeling), about 6 different nurses rushed into the room and OB left to get scrubbed. One whisked Jordan away to scrub in, one was unhooking/relooking my IV to different meds/machines, the CRNA came back to tell me about anesthesia options, people were filing paperwork, I was signing stuff, etc. It was chaos, but it was organized chaos. They wheeled me down the hallway to the operating room, and all I could think about was how badly I hoped we didn’t pass the waiting room in the process because I really didn't want my mom to see me being wheeled into surgery, since, as far as our parents knew, we were back there pushing. Everybody had scrubbed in by the time we hit the door of the OR; OB and the CRNA were both already there and gloved. They moved me from my gurney to the operating table, put a cap on me, and started a scratch test. I remember making sure they grabbed my pillow from the bed because it wasn’t the hospital’s and it’s my all-time fave pillow (#priorities, obviously). They took a needle and poked up my legs and abdomen, which I couldn’t really feel. Then they started the process of placing a urinary catheter, which was really uncomfortable and I could feel most of. Our badass nurse, K, realized that I could feel that and told the CRNA that it was clear the anesthesia wasn’t working well enough in the epidural alone to do the surgery with just that. The CRNA then decided it would be best to do a spinal block for the surgery, so she numbed the area and administered the block (which I couldn’t really feel). At this point, my memory of this whole thing is really spotty. I actually had to ask OB (at my 6 week follow-up last week) how long we were physically in the OR, because I have no concept of how much time passed. The answer was about an hour and 45 minutes. I think the easiest thing to do is explain what happened from a medical perspective, then explain what it was like on my end. Apparently, the epidural catheter was placed really poorly, which is why I was able to feel the pain of back labor earlier. Ordinarily, they would have re-placed the catcher (epidurals have a catheter just like an IV port, and the meds are administered through the catheter) before the C-section, but since the baby was in distress, they didn't have time to do that. Once they realized I wasn't numb in the OR, the CRNA made the call to do a spinal block. Because of the back labor, I had had so much extra medication put into the epidural catheter that there was tons of anesthesia already in my spinal space, and when the spinal block was administered, all of the anesthesia in my body shot to the top of my spinal column, paralyzing me from the chin down and also paralyzing my diaphragm, making it impossible for me to speak or breathe on my own until the anesthesia burned off. It's what's called a "high spinal," and is really rare, so if you're reading this as a future mom, this isn't something you should worry about. My second real memory is looking back over my shoulder to see Jordan doing skin-to-skin with the baby since he knew I wanted to but wasn't able to. He was singing to the baby and crying, both because our son was so perfect and because when he entered the OR, I wasn't responsive and it scared the hell out of him. The surgery itself went perfectly. Mac was born at 5:55 PM, weighing in at 8 lbs, 7 oz, 20 3/4 inches long. He passed his Apgar with flying colors, and Jordan brought him over to see me on the table. I peeked over the blanket to see the tiny miracle we had made for the first time, and all the emotions I'd been working so hard to control flooded out of me in full-fledged sobs. He was all at once a stranger and my most familiar friend. After I the surgery was over, everything went just about the way you think it would. Our poor parents had been waiting without an update for a long time, so they were pretty freaked out to learn what had happened since all they knew was that I had been wheeled into surgery, then two hours passed with no news. But when they came back to the recovery area to see us (Mac included), we got this. 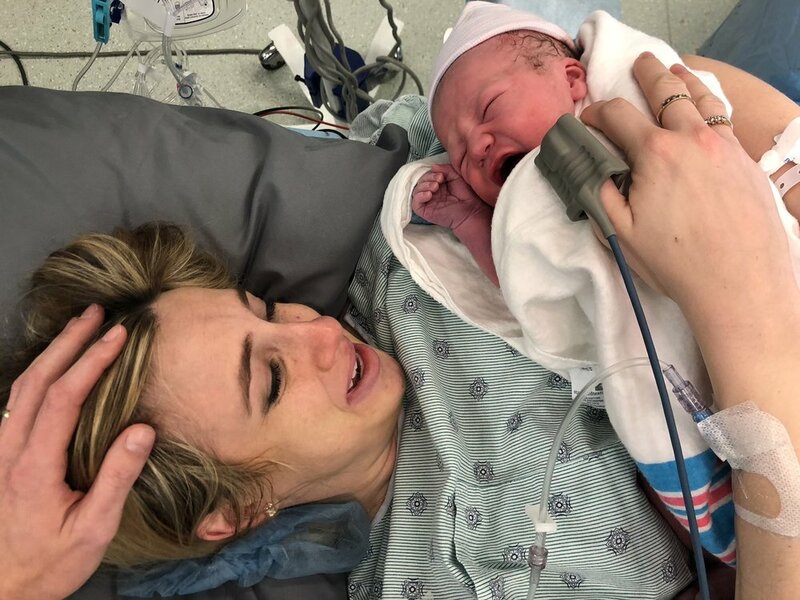 Mac's delivery was easily the most frightening thing I've ever gone through in my life, piggybacking on the experience of childbirth, which is already momentous and life-changing in so may ways. Once everything was resolved, the anesthesiologist leaned down by my head and said, "You've got ice in your veins, girl. I don't know how you handled that so well." I'll take that with me for the rest of my life. I didn't know that I was as mentally tough as I was. I don't think I'm tougher than anyone else; that experience showed me that I think we all have ice in our veins if we can dig down deep enough to tap into it. Having Mac showed me that I can survive a great deal more than I ever thought possible, and that I can stand on my own in the face of a really harrowing situation. I have never thought of myself as a particularly strong person - kind and compassionate, but not tough. Now I know that I am capable of dealing with absolutely anything that comes at me, that I have the drive and grit to dig my heels in and finish the job when the going gets tough. I am proud of myself. I didn't know I had it in me. The photo below was taken on the day we left the hospital. My mom snapped it hours before we were released into the real world, leaving the cocoon of the hospital for the first time in over 3 days. I was still swollen, sore, walking hunched over a bit. The first time I saw this photo, I didn't recognize the woman in it. The new mom, holding her perfect newborn son. I am getting to know her, too. She is all at once a stranger and my most familiar friend.